The 2017/2018 was once again marked by almost total dominance from the most winning German team. Bayern München almost went through the league on cruise control, while also ending just short enough to secure a spot in the Champions League final. Now they just need to get the DFB-trophy, to end off their season with a Double and a new 2018/19 Home Shirt. You can’t really say Bundesliga without saying Bayern München. The Bavarian team has been a total dominance force in German football, and currently they have won the last 6 season, which is the record for most won Bundesliga trophies in a row. But looking beyond this, they have also won the Bundesliga 28 in total, DFB-trophy 18 times and Champions League 5 times, impressive statistics! 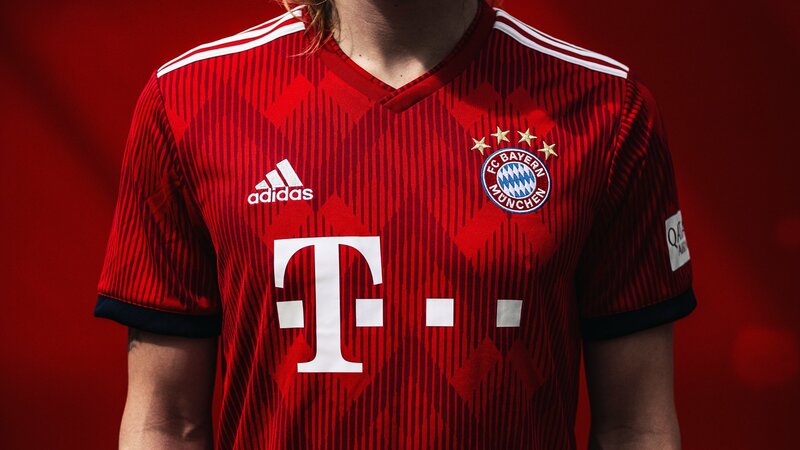 The new Bayern München 2018/19 Home Shirt is made in the traditional red colour as previously seen on their Home Shirts from other seasons. The 2018/19 Home Shirt is made in to shades of red, one being the base and a darker red, which shapes a nice graphical design. The Bayern München 2018/19 Home Shirt is going to complemented with dark blue shorts and red socks, which takes inspiration from the 1990’s Home Shirts. The front of the Home Shirt has a nice graphical design shaped as diamonds. This design could have been chosen to take some focus away from the sponsor logo’s and club crest, which gives the a shirt a more authentic look. Furthermore, the diamond design is something which is seen before on Bayern München. This was back in the days when Oliver Kahn rocked a blue goalkeeper kit during the 1996/97 season. The kit was also made with a graphical design shaped as diamonds. The diamond graphical design could also be seen as a connection to the alps, which lies close to the Bavarian area. The diamonds can be seen as multiple mountain peaks, with the Bayern München team being on the top of the peak, and with other words being in the top of European football. Taking a more thorough look on the details. The sleeves cuffs are made in a dark blue colour making the Home Shirt design more complete. The same goes for the Socks, which has placed the dark blue colours on the top. Rumors has it that Bayern will debut the brand new 2018/19 Home Shirt in their next game this weekend. Looking forward to get your own Bayern München 2018/19 Home Shirt. Pre-order the new Home Shirt right here!